The video explains partitioning of Shannon diversity into two independent components: alpha (within group) and beta (in between groups) diversity. It helps to understand beta diversity as a measure of variation between different samples of data distributions. Some practical applications in the field of business analysis are shown. Hoover index is one of the simplest inequality indices to measure the deviation from an ideal equal distribution. It can be interpreted as the maximum vertical deviation of the Lorenz curve from the 45 degree line. Theil index is an inequality measure related to the Shannon entropy. It is often used to measure economic inequality. Like the Shannon entropy, Theil index can be decomposed in two independent components, for example to descbribe inequality “within” and “in between” subgroups. Low Theil or Hoover index means low inequality, high values stand for a high deviation from an equal distribution. we see that for the symmetric Theil index the difference (pi – wi) is weighted with the logarithm of pi/wi. 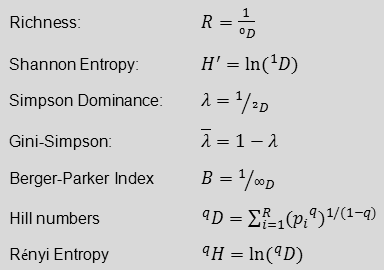 How does the Theil index relate to Shannon entropy? The symmetric Theil index is simply half of the difference between mean log deviation and Shannon entropy. sj is the share of E in group j (Ej/Etot); wj the relative number of items in subgroup j (Nj/Ntot). The first term in (10) gives the “within group” component, the second the “between group” component. The Concept of diversity is well introduced in Ecology, Economy and Information theory. The underlying mathematical theory relates to statistics (probabilities), multivariate analysis, cluster analysis etc. Diversity can be partitioned into two independent components: alpha and beta diversity. In the following the concept of alpha and beta diversity is explained, using a simple example of selling drinks in different sales areas. It helps to understand beta diversity as a measure of variation (similarity and overlap) between different samples of data distributions, and gives some practical applications in the field of business analysis. To understand the basic concept of diversity, you might watch my video here; it explains how diversity can be characterized using diversity indices – like the Simpson index – taking into account richness and evenness. In general the concept of diversity can be formulated using the power mean. The Simpson index is based on the arithmetic mean, in the general concept of diversity it corresponds to a “true” diversity of order two. H = – ∑ pi ln pi. For an equal distribution – all types in the data set are equally common – the Shannon entropy has the value of the natural logarithm of Richness H = ln(R), the more unequal the proportional abundances, the smaller the Shannon entropy. 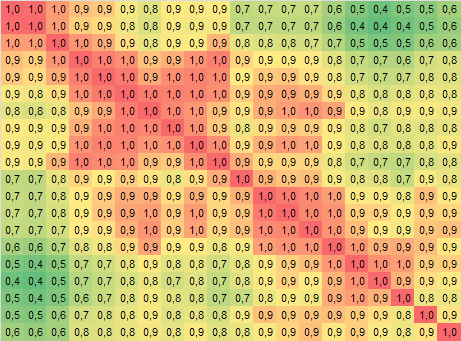 For only one type in the data set, Shannon entropy equals zero. Therefore high Shannon entropy stands for high, low Shannon entropy for low diversity. Let us go back to our example of selling different drinks in a restaurant. Selling only one type of drink, the Shannon entropy takes a value of zero, the natural logarithm of 1. 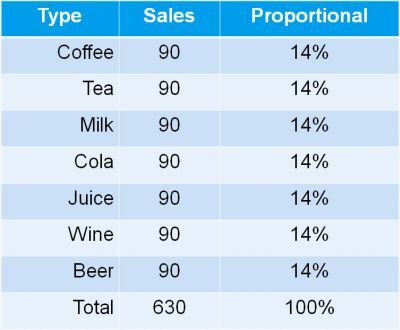 Now let us assume we manage a couple of restaurants in different locations, and we get a monthly summary report of total sales of the different type of drinks. Does it mean we are selling all drinks evenly in all locations? There are actually two possibilities. 1. The first one: yes, at each location we sell evenly all types of drinks. High diversity – a Shannon entropy of 1.95 – in Boston, NY, Denver, Austin, etc., resulting in a high diversity of sales for the total sales area. 2. What is the second possibility? 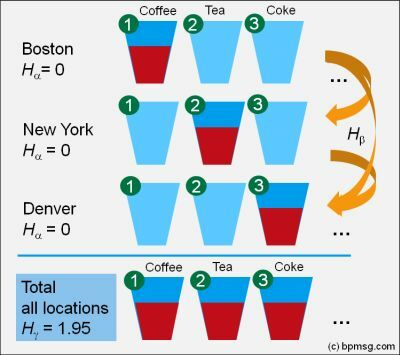 In Boston we are selling coffee only: low diversity with Shannon entropy of zero. 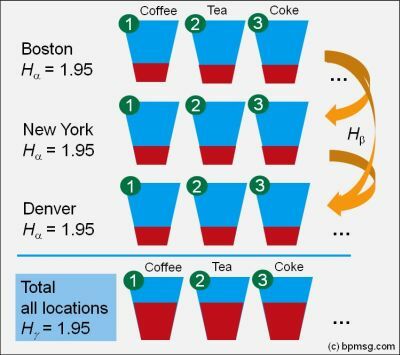 Similar in NY; here we are selling tea only, low diversity with Shannon entropy of zero, but selling a different type of drink: tea instead of coffee! Similar in Denver with milk, Austin with coke, and so on. Looking at our total sales – it looks the same as in the first case – the total diversity is high, as overall we are selling all drinks equally. Diversity in the individual location is called alpha diversity. Our total sales report – the consolidation of all sales location gives us the gamma diversity, and the difference – gamma minus alpha diversity reflects the beta diversity. Beta Diversity – How to interpret? In case one we find a high alpha diversity in each location, resulting in the same high consolidated gamma diversity taking all locations together. So the difference between alpha and gamma, i.e. the beta diversity, is zero – we have the same sales distribution and a total overlap in all locations. In case two we find a low alpha diversity in each location, but a high consolidated gamma diversity taking all locations together: In this case the difference between alpha and gamma diversity, i.e. the beta diversity, is high – we have totally different sales distributions among the locations, selling only one, but a different type of drinks in each location – we got totally different distributions without overlap. Beta diversity is a measure for similarity and overlap between samples of distributions. Partitioning diversity in alpha and beta diversity allows us to gain insight in the variation of distributions – relative abundances – across samples. Alpha, beta and gamma diversity can be calculated in a spreadsheet program. 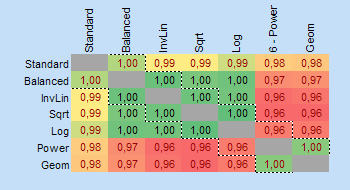 Read my post about my Excel template for diversity calculation. In my video “Diversity Index as Business KPI – The Concept of Diversity” I explain the mathematical concept of diversity introducing the Simpson Index λ and its complement (1-λ) as a measure of product diversification in markets. For calculation of Shannon entropy and its partitioning into independent alpha and beta components see here. My video “Diversity Index as Business Performance Indicator” is now added as episode #14 in my BPMSG podcast feed. A business relying on a single type of product or services can be highly risky. Any change in the market place – a change of customer behavior, a new competitor – might have a high impact on the business results. Diversification is an opportunity to spread and reduce the potential risks. The mathematical concept of diversity has many applications, ranging from ecology over demography to information science. In the context of business performance diversity indices can be used as key performance indicators (KPIs) to analyze markets, define targets for diversification, and track the success of derived business actions. Decisions can have a short- or long-term impact; they can be strategic or operational. Measuring strategic or operational performance might require a different set of key performance indicators (KPIs). You need both: Operational KPIs help to measure the short term performance of an organization, strategic KPIs help to measure the implementation of a long term strategy. 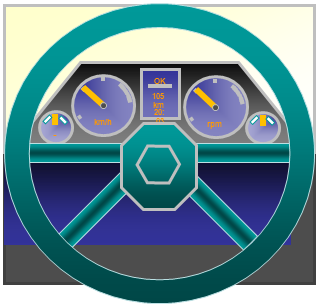 This new podcast episode #13 explains the differences, using the picture of driving a car.